Have I mentioned I love Sushi? I absolutely love sushi and have always been amazed at how effortless true masters of the craft make it look. So a few weeks back, I began looking into what tools and supplies I might need to begin learning this craft. What I came to learn is that it is a lot cheaper and easier than I had expected. My first step on this journey back to the Far East was to scour the internet for resources. The App store had a decent program called How to Make Sushi. It provides step by step directions and many high resolution pictures of the differing styles of sushi. Also, I discovered that Amazon (An affiliate of the show) pretty much has anything you could possible think off related to Sushi prep (Including fresh yellow fin tuna which can be overnighted to you.) I found a pack of 50 Nori sheets (Cost $11). This should be enough seaweed to last me a year. It comes in a re-sealable package, so I imagine they will keep for quite a while. The thing that you will hear and read most frequently about sushi making is that the prep of the rice is very challenging. I found that to be only partially true. Following the instructions on the sushi app, I absolutely ruined the first batch of rice I tried to cook. I don’t necessarily blame the app for steering me wrong. I think it has to do with the variations in rice available. I would highly recommend that you simply follow the directions that are printed on the side of the bag of rice. For this adventured I used a top grade sushi rice that I found on Amazon.com. A 5Lb bag Sushi rice (Cost $13). That’s enough rice to make at least 100 rolls. 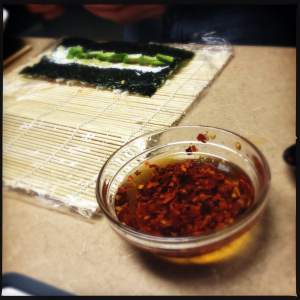 Once I got the texture and consistency of the rice correct, I went back to the sushi app for the dressing. The dressing consists of a blend of rice vinegar, salt and sugar. It really adds a lot to the flavor of rice. The directions on the app worked great and I was very pleased with the overall results. 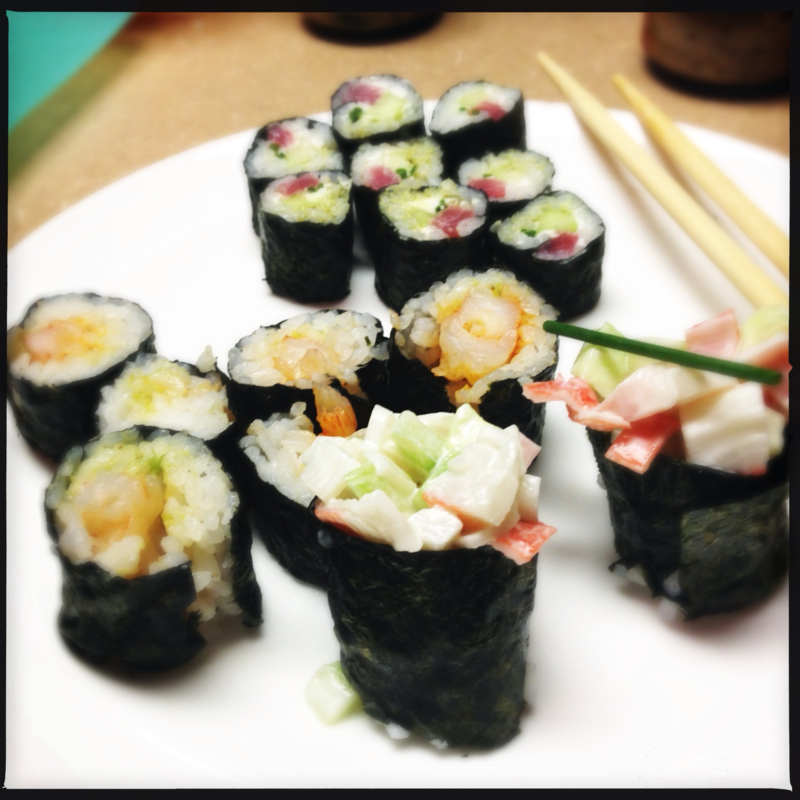 After prepping the proteins and veg, it was time to break in my brand new set of sushi rolling mats. I bought a Sushi Rolling Kit, which consisted of a set of 2 bamboo rolling mats and a wooden spoon (Cost $7). It is really important that you line your mat with cellophane before you get started. It will make clean up a lot easier. 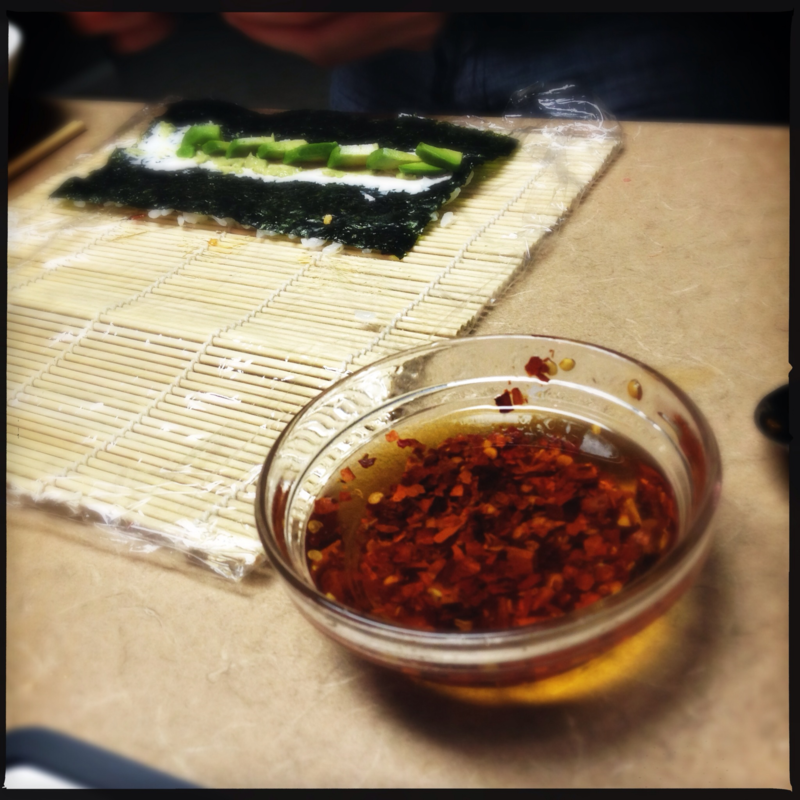 With my mats protected, I plunged headlong into a night of sushi rolling. I have to admit, I was a bit nervous rolling my first sushi roll. After only a very short time, I got the hang of it and was making pretty decent looking product. 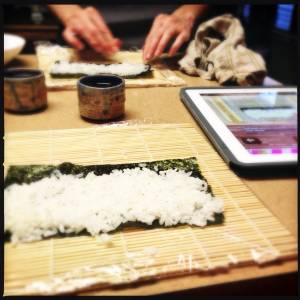 Again the sushi app had great pictures that really helped with placement of the rice, dressing and proteins onto the Nori sheet. Once I had the rolls in tube form, all that was left to do was to cut and eat. That brings me to my final point. It is crucial that you have a very sharp thin bladed knife for cutting. If you don’t, you will simply crush your rolls. I’d recommend the Non-stick Sushi Chef’s Knife At around $10 it is a pretty good deal. I don’t expect that it will hold an edge for long, but its non-stick properties are really helpful. So after this experience, am I now a sushi master? Hell no! It takes years, maybe even decades to hone your skills to the level of high end sushi chefs. What I can say is that after a mere night of practice I produced some very tasty rolls. Frankly, it’s a lot of fun and a great way to spend a Friday night. For right at 60 dollars, you can get all the basic supplies to make sushi for an entire year. Through the process, I also developed an increased understanding of the excessive markup on the sushi purchased from restaurants. 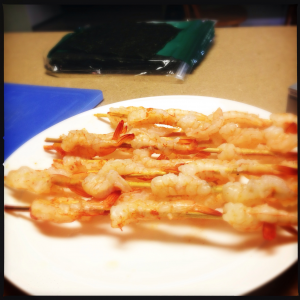 I am really glad that I decided to try making sushi, and look forward to added it in my cooking night rotations. For more information on sushi rolling and other cool happenings in Denton, Check out the podcast by clicking the link below.